As the APC Presidential campaign train moved to Osun state at the weekend, people of the state have been urged to vote for the party to sustain continuity. The rally, its came after that of Ibadan was well attended by APC party leaders, ministers and chieftains and teeming supporters. President Muhammadu Buhari in his address appreciated the people of Osun for their support and also for voting APC as their governor. He reminded the people of the state on the condition they met the country in 2015 and the progress made so far. He said his administration was doing its best to fight corruption and bribery as anyone found guilty will be brought before the law. The Vice President, Prof. Yemi Osinbajo who was overwhelmed by crowd demonstrated to the people of Osun state how to vote on election day. 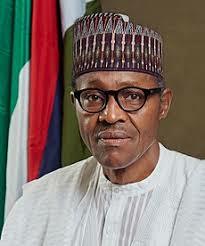 He noted that they must ensure that all efforts made by the opposition party to draw them back must be kicked against. Also speaking, the National Chairman of the party, Comrade Adams Oshiomhole said he now understood why People’s Democratic Party (PDP) and other parties are afraid of APC because of the crowd chanting Buhari all the way from Ibadan to Osun state. His words: “The president has showed the world that he is a man of good character and integrity and also on how to keep the country together. The National Leader of the party, Asiwaju Bola Ahmed Tinubu said for 16 years, the PDP deceived us all. Our children couldn’t go to school, while some couldn’t find a job. Tinubu recalled that the PDP government failed to recognize the late Bashorun Moshood Abiola, the presumed winner of the 1993 presidential election, who was denied the fruit of his victory. He prayed that while voting for the APC in the coming election, it won’t turn to bad luck for them. The Governor of Osun state, Mr Gboyega Oyetola reminded the people how they have benefited immensely from the federal government programmes. 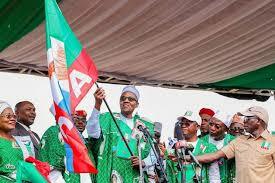 “APC is the party of now and the future. “The president has done so well in the area of corruption, infrastructure and health, the best we can do is to make sure the good work continues, Oyetola said. At the rally were former House of Representatives Speaker, Olubunmi Etteh, former Deputy Governor, Titilayo Laoye –Tomori, Osun State First Lady Kafayat Oyetola and former First Lady Sherifat Aregbesola. Senatorial candidates, Bashiru Ajibola (Central), Ajibola Famurewa (East) and Adelere Oriolowo (West) and House of Representatives candidates were given party flags at the rally.